Roughly chop the onion and ginger. Deseed the chilli, remove the core from the lemongrass, roughly chop both, place in a blending cup along with the garlic and all the other ingredients up to and including the nutmeg. Blend all of the ingredients to a paste, transfer to a bowl. Rinse the lime in hot water, pat dry, grate half of the zest and squeeze out half of the juice. Add to the spiced paste along with the meat and all the other ingredients up to and including the salt, knead thoroughly until the ingredients have combined to form a compact mass. Divide the mixture into 15 portions and press around the skewers with wet hands. Heat the oil in a non-stick frying pan. Fry the skewers in batches over a medium heat for approx. 15 mins. all over, remove from the pan and serve with the sweet chilli sauce. 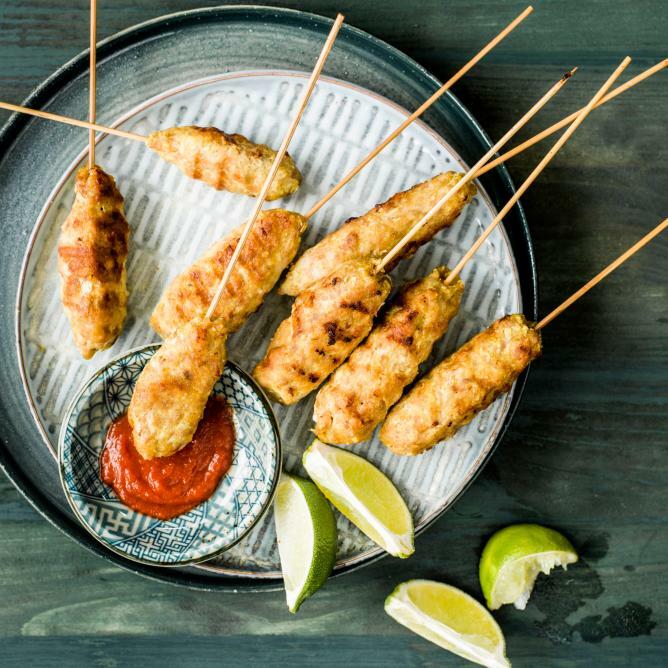 Serve with the lime wedges, squeeze over the satay skewers.